Regions Security Services, Inc. is one of the fastest growing companies in South Florida specializing in security and ancillary services. Residential communities, hotels, commercial, retail, industrial, and construction, government and educational agencies. We want you!!! We have many promising careers for all qualified candidates. We are an innovative company and have a desire to work with dedicated security professionals with a strong work ethic. You must be legally eligible for employment in the United States (you will be required to provide documentation to verify eligibility). Applicants must have flexibility to work any shift and weekends as required. You must have verifiable previous employment and personal references. You must have or ability to obtain a valid Class Security License issued by the State of Florida. You must have the ability to obtain a valid Class G Armed Security License for Armed Positions. Must be able to provide your own transportation to and from work. You must agree to be subjected to a criminal background check. Possess the ability to apply common sense knowledge and technical skills to correct problems in the field. Capable of prioritizing tasks and setting priorities during the work shift. Present a positive and professional image. Customer Service is a MUST, ability to write reports. 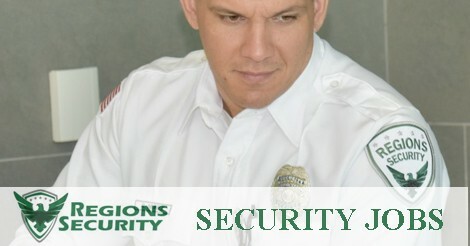 Regions Security Services is an Equal Opportunity Employer committed to hiring a diverse workforce.